The Bad: Can Panini Learn From It's Mistakes? 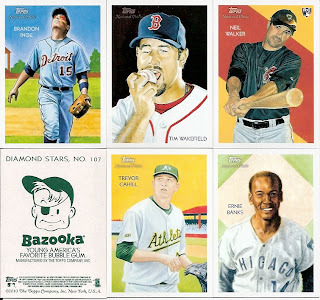 We'll continue this series with a look at some of the problems Panini faces with being successful as a baseball card company. First, remember that Panini is essentially Donruss/Leaf/Playoff. This is the company that went bankrupt in 1998 and lost its baseball license in 2005. Why did it lose its license? 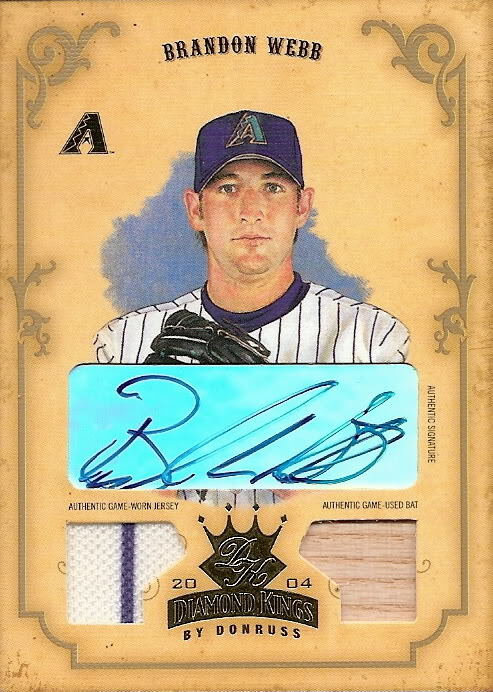 Let's just take a look at one set from 2004: Diamond Kings. There is an antiqued feel to the cards and the design is reminiscent of the early 1900s. It's a great looking set. But the base set isn't very basic: the first 150 cards are normal, but cards 151-175 are SPs and they come with sepia parallels, making for an extremely difficult, expensive 200 card set to put together. 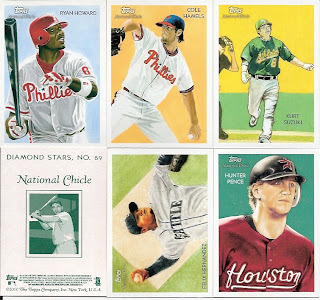 Speaking of parallels, the set has a parallel for every price level. The entire set comes with foil parallels in bronze, silver, and platinum; and framed bronze, silver, gold, platinum black, platinum grey, and platinum white. 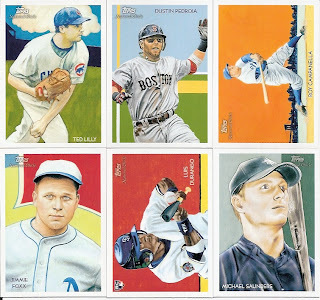 The parallels look nice, but there are 19 different parallels, several of which are 1/1s. If you want memorabilia parallels, there are 20 of those, and another 20 parallel versions of autographs. How about autographed memorabilia cards? You guessed it, 20 more parallels. There are five insert sets, each with an average of three additional memorabilia or autograph parallels, plus an additional memorabilia insert set with five variations. Diamond Kings is a beautiful set, and the framed parallels look fantastic. 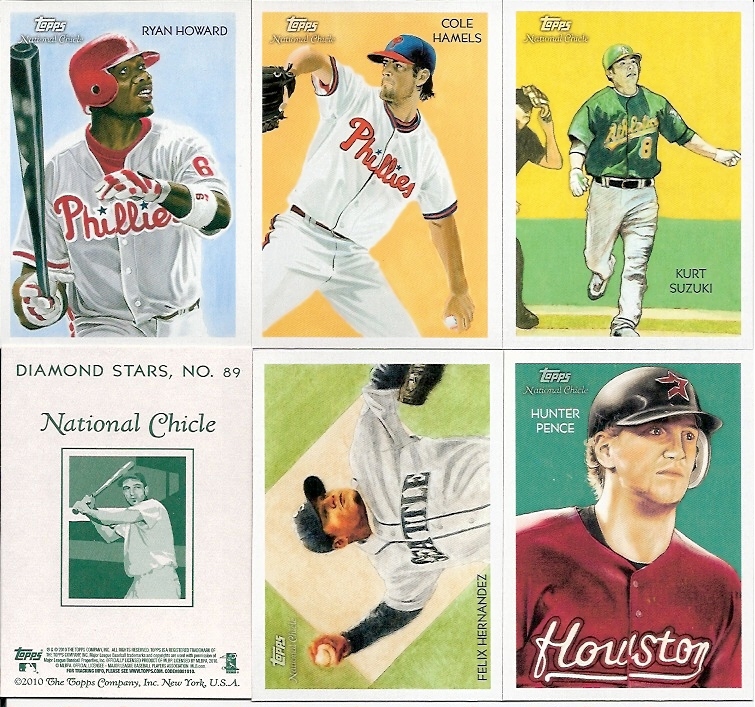 But the 2004 Diamond Kings release has 106 sets, of which only seven are originals - the rest parallels. 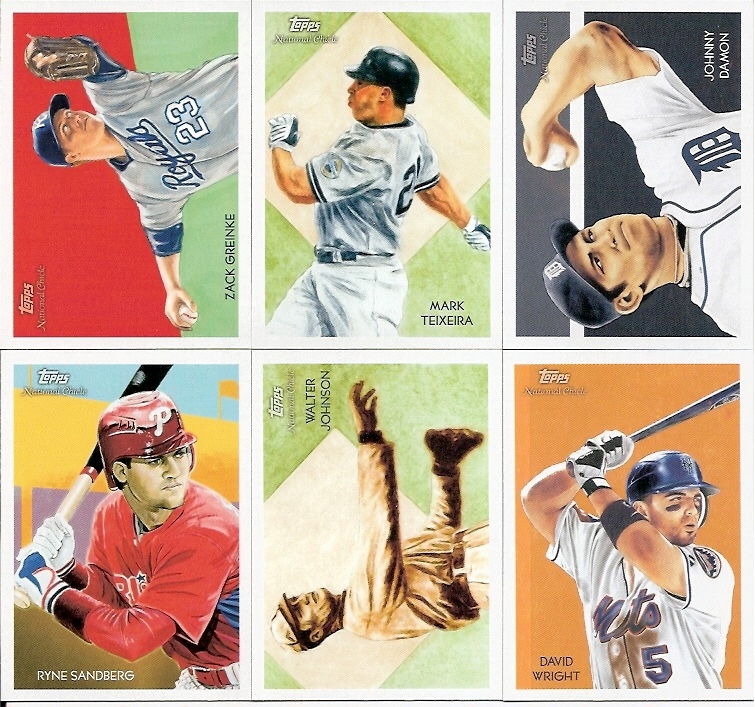 There are 80 different sets using the base design, with foil, memorabilia, autograph, and frame variations. The Leaf release encompasses 147 sets; 88 of them are variations in the Exhibits insert set. The intention here was to increase "value" by providing more lower-quantity cards, especially 1/1s. However, with dozens of 1/1 cards that are nearly identical, 1/1 loses its luster. 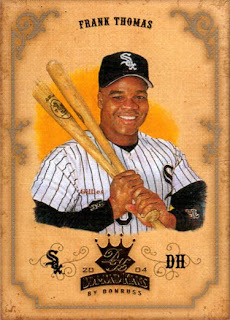 The devaluation of low-numbered cards can be traced almost directly to Playoff's massive set offerings with dozens of low-numbered memorabilia and autograph sets. 2005 was even worse, but I'll discuss that in part five (and for some releases, that has some other reasons). Looking at Panini's recent offerings, it seems that they're doing some of the same - their 2010 Plates and Patches issue has 61 sets, and 2011 Score has 40 sets - with seven parallels for each insert set. 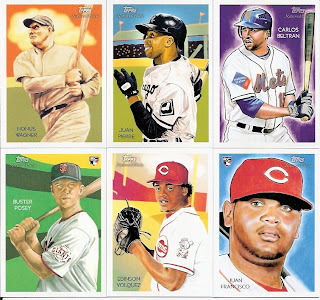 For comparison, Allen & Ginter has 43 sets, but no insert set has more than three parallel variations. A&G's base set has 7 non-plate parallels, all of which are in mini form with several unique variations (wood, silk, etc). As a type collector, I'd rather see the A&G format with minimal parallels than an issue with only seven unique designs and 99 parallels of those designs. 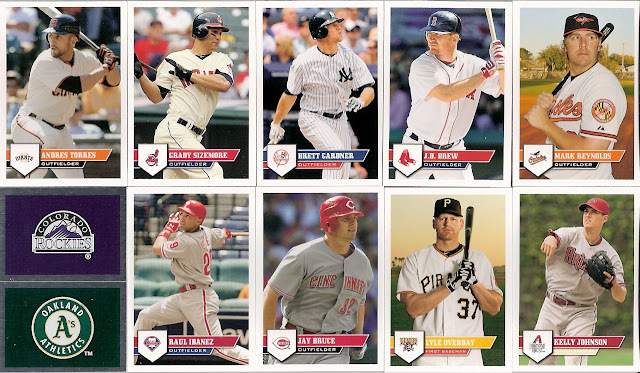 The other bad thing Panini must face: the 2009 MLBP lawsuit. The judgement (the meat starts on page four) states that Donruss can not issue cards of players in any form of airbrushed or obscured uniforms, or even MLB-trade catchers equipment. The suit names Ann Powell explicitly (see the top of page four), which makes me wonder if Panini will play the legal game stating that Ann Powell has no part in whatever Donruss may be today. If Panini follows the suit completely, we could be looking at cards similar to Goodwin Champions - it could even be implied that team colors are MLB's "uniform trade dress." 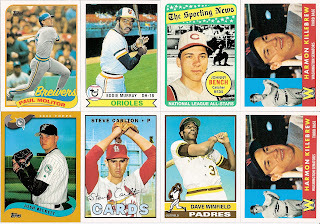 The argument of airbrushed (or even posed) photos is a different subject for another day, but it is a detriment to the card in a large percentage of collectors' minds. I think I figured out why so many people hit on my post where the title was "Hey!!! This is a trade post!" Maybe they were expecting trade bait? Well, I've been promising to post my list of 2010 Topps National Chicle cards for trade, and now I will finally do just that. First, a real quick thanks to Night Owl for the prize winnings - I will be devoting a full post in the near future, and another quick real big thanks to Jim for the cards yesterday. He mentioned he's building this set so I'm going to give him first picks through the list (I owe him), but make your comments and I'll get back to you ASAP as always. 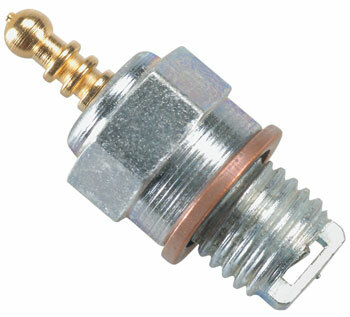 Base: 1, 6, 8, 10, 11, 22, 29, 31, 33, 34, 35, 37, 38, 38, 40, 43, 45, 46, 47, 48, 56, 58, 60, 71, 73, 73, 75, 76, 78, 80, 87, 88, 91, 92, 93, 95, 96, 97, 98, 99, 107, 111, 112, 114, 115, 116, 118, 120, 121, 122, 123, 125, 126, 128, 133, 137, 139, 141, 143, 145, 147, 149, 151, 152, 153, 158, 161, 163, 165, 166, 168, 176, 178, 181, 185, 187, 196, 198, 201, 203, 205, 206, 210, 211, 213, 216, 217, 218, 220, 221, 223, 226, 228, 229, 230, 231, 232, 233, 235, 236, 237, 239, 241, 245, 247, 251, 252, 253, 254, 255, 256, 258, 260, 262, 263, 265, 268, 271, 273, 275. National Chicle back: 24 Kevin Kouzmanoff, 49 Adrian Gonzalez, 89 Chone Figgins, 187 Joe Saunders, 210 Robin Yount, 217 Frank Robinson, 250 Joe Morgan. 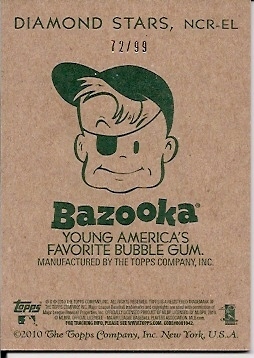 Bazooka back: 55 Carl Crawford, 107 Mark Teixeira, 239 Walter Johnson. How do card companies compete with video games, in-your-face TV advertising and Disney programming, and instant-update websites? This is a question for which there is no real answer. There have been many attempts at making cards more interactive. Topps was part of a product towards the end of the 1980s which played clips with a special device. Post inserted baseball CD-ROMs into its cereal boxes one year. Upper Deck tried baseball card-sized interactive CD-ROM sets called PowerDeck. Pacific created a website which tied directly into the Pacific Online release. Card game inserts have been added to products to drive collectors to company websites, where entering codes can unlock online features, collections, points, and games; most recently Topps' Million Card Giveaway and Diamond Anniversary unlocked actual cards that could be mailed to your house. There have been all sorts of devices that play sounds. One of those is the ProTalk audio card. Two "sets" were released between 1998 and 2000, with one (seen above) devoted solely to Ken Griffey Jr. 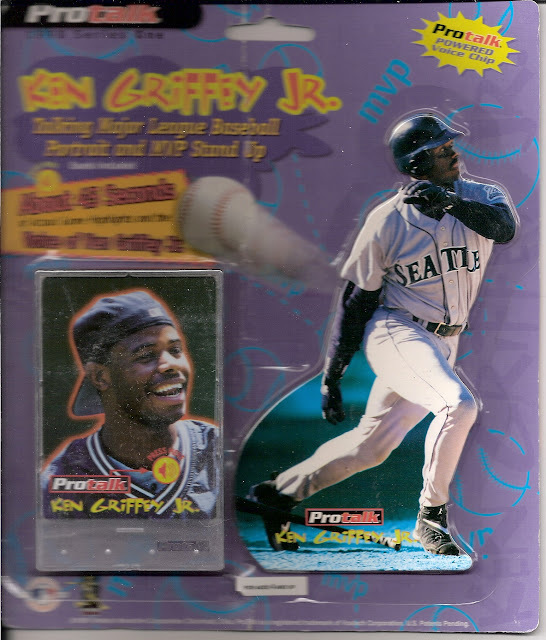 The Griffey set contains only four cards, each accompanied by a stand-up figure. All four stand-ups can see on the back panel advertising. 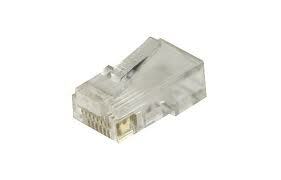 Pushing the speaker button on the card should provide 45 seconds of audio from the event specific to the stand-up. For instance, this stand-up has audio from his 50th home run (of the season, I assume). 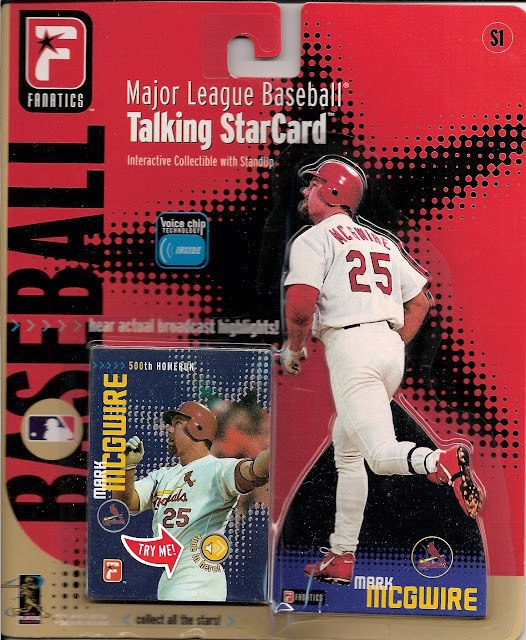 The packaging on this card makes it impossible to sample the audio - if you compare this to the scan below, you'll see the Griffey card is contained in a hard plastic case, while McGwire is not. Since the package is still intact, even if not mint, I have no way of knowing if the audio works. The second set issued over the time period was the red-backed regular set. 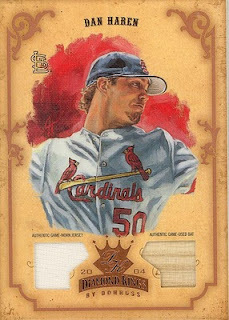 The McGwire carries a 2000 copyright date on the back, but the upper-right corner of the front seems to identify this as still being part of series 1. There are fifteen cards total, with one or two issues per player. Players with two cards have different highlights. Unlike the small Griffey set, this card's audio button can be pressed. I made the mistake of testing it out, and was subjected to about 40 seconds of a high pitched soft whine, much like the sound effect heard when Wile E Coyote would fall long distances. 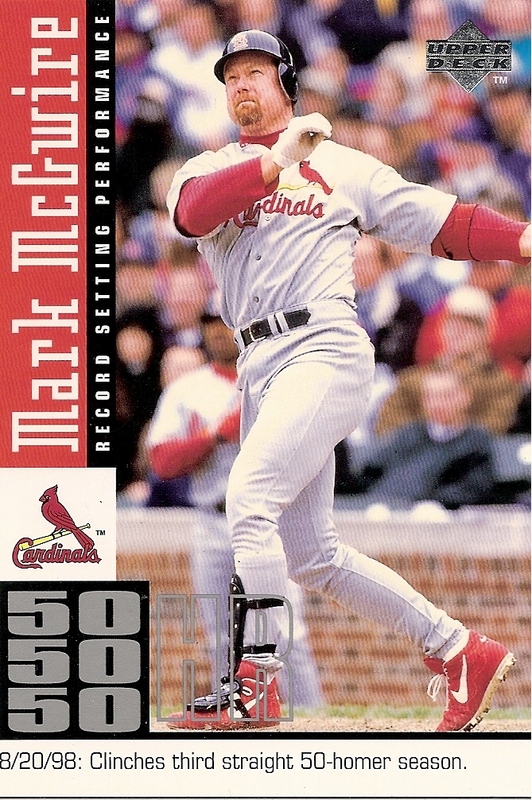 Then, when all hope was lost, I heard a small bit of the original clip, the radio broadcast from McGwire's 500th home run. Let's be glad there's a stop button on that video. It's a fun product if it works, but products like this have a hard time finding a home, torn between digital gamers and internet users who want more than a simple audio product, kids who don't have much allowance to spend on products like this, and collectors who don't connect with these "gimmicky" hybrid products. But at only 19 cards, a master set might be a nice oddball to acquire. A better tribute: McGwire or Ichiro? Before MLB authentication, PSA, and JSA, there was Upper Deck. As certified autographs were still in their infancy, the company created a division to bring authenticated merchandise to rich collectors. Mickey Mantle was one of the signers for some of the many autographed memorabilia offerings, but UDA had the occasional authentic event-used race car. More UDA than UD, several special cards and card sets have been released over the years to commemorate events and players. The first is this card from the 31-card set about McGwire's 62 home run season in 1998. The full set was distributed through the Home Shopping Network as well as retail and hobby channels for $19.99. Each card is 3-1/2" by 5" and focuses on a specific home run that year. There is a limited edition jumbo card commemorating the 62nd home run that was offered on HSN and then through dealers in addition to this set, which has the same basic design as this set. 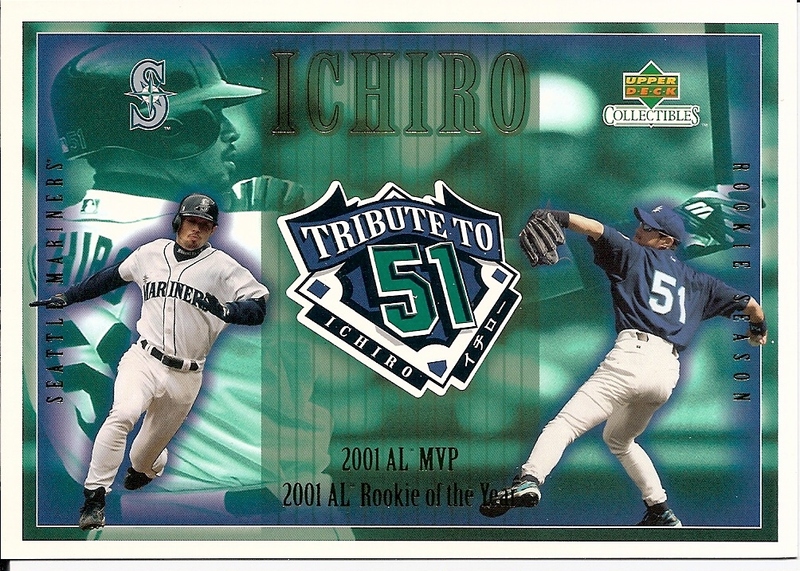 The Ichiro Tribute to 51 set was 25 cards deep, with some cards being "regular" cards and the last five identifying milestones in the 2001 season, all normal size. 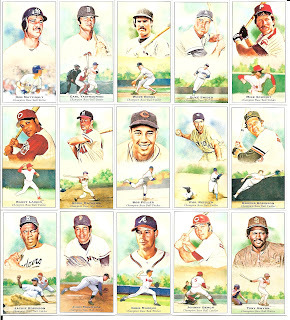 This card is a special jumbo card (again, 3-1/2" by 5") included with the set and sequentially numbered on the back. Which tribute is better? 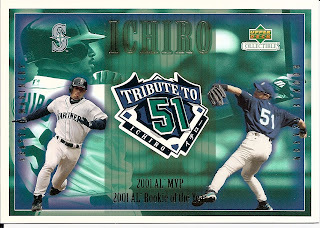 Hands down, I choose the Ichiro card. 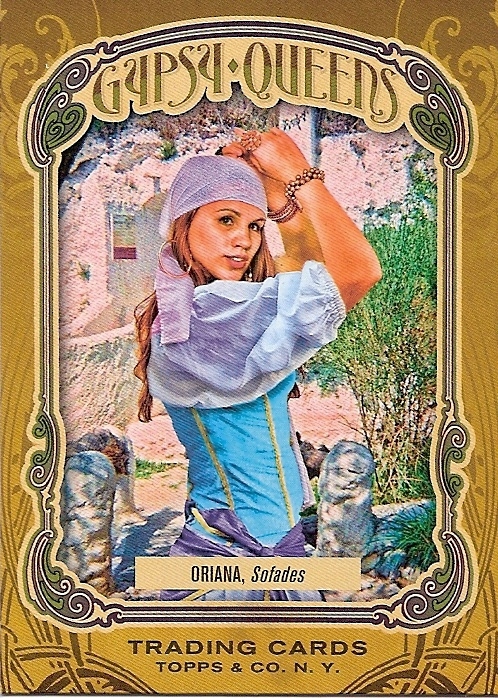 There is more actual design to the card, with several photos, gold foil printing, and an attractive logo in the middle. 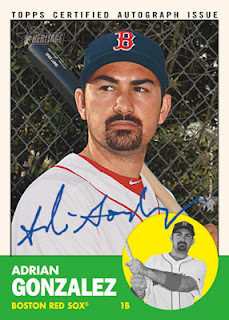 A future issue commemorating the 2004 Red Sox season (it's towards the bottom of the page) isn't as attractive as this card. It pays to be patient, sometimes. 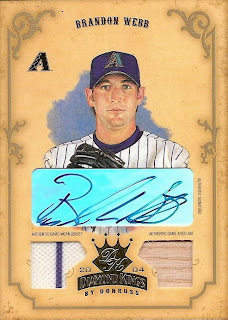 We all remember the Gypsy Queen craze of 2011. Everyone and their mother wanted to build the set. The base set (without SPs) has an amazingly high book value of $60, after all. I finished my set in June, thankfully, though now I'm thinking I'd like to try to build the SP set. That's probably a bad idea. But one plan that wasn't: putting together the insert sets this summer. 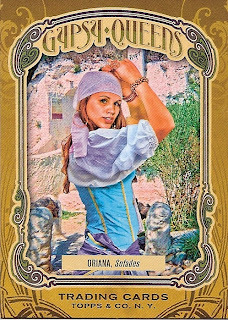 The Gypsy Queens set is the toughest insert set to complete in Gypsy Queen, hands down. 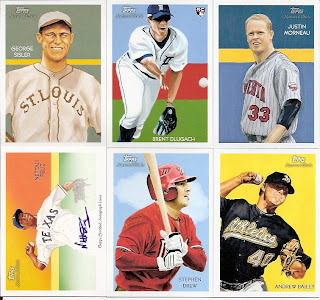 I find one or two cards a month at reasonable prices, with reasonable usually meaning the dollar boxes. There are still eight cards missing in my set: 3, 4, 6, 9, 10, 13, 16, 19. If I'm patient, I'm sure they'll show up at a card show. I've also been patient with the Bowman's Best insert sets, and that patience has paid off. These two were in dime or quarter-style boxes. I also found Pujols sitting in a dollar box. Buster Posey and Stephen Strasburg are the two remaining players. Posey won't come cheap around here, and Strasburg is a gamble. I may just go to Sportlots for them in the next month or two - all the Best and Best Prospects other than Harper can be had for a total of about $6.25 right now. Yes, I managed to purchase doubles at a show. I do that more often than you'd think. Double or not, the checklist of needed cards whittles down. But even with those cards, the task of finishing my series 2 needs (with Kimball and the base set) would still seem daunting if it wasn't for Dan. You don't know Dan? Of The Other World? Dan's Other World? Why not?! Dan was cool enough to just randomly, out of the blue, send me some cards sitting on the want list! Four more cards from the 60YOTs! Dan didn't send all of these, but he did send almost all of them! Scans look better in rectangles, anyway. Thank you very much, Dan! I'll be sure to return the favor soon! I'm sure I have a bunch of cards off his lists. HEY,this is a trade post!!! Jon over at Community Gum inspired the title for this post, but he didn't send anything you see below. Greg from Toronto (I don't think he has a blog - Greg, if you do, please let me know!) needed two stickers to finish his 2011 Topps Stickers set. I had both, but one had been claimed. So off went the single sticker to Canadia (typo intended)! In return, I now have ten more stickers! Yes, he even sent a foil! I also picked up a couple packs a couple weeks ago. Here they are! I've updated the sticker have list on this page so if you're looking to trade, I'm your man! Finish your set! Impress your friends! Be a kid again! 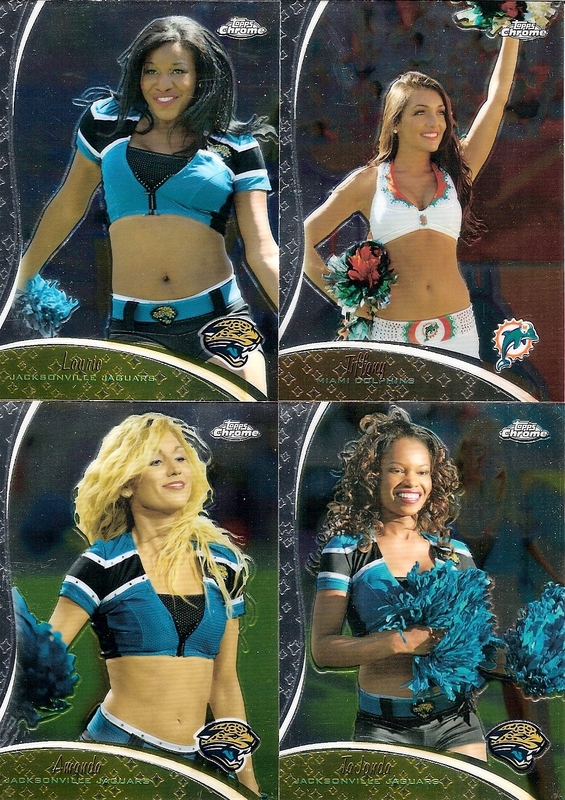 What is the purpose for including cheerleaders in a card set? Do these young ladies provide any sort of benefit to the team? If the Gold Rush (is that right?) don't show up for a game, do the 49ers play worse? I know the answer. NFL cheerleaders are eye candy. They wear uniforms that are on par with a stripper's wardrobe and they shake their bodies and kick their legs to give you something to look at between plays. The same can be said for most college cheerleaders as well. While high school teams don't (and really can't) discriminate on looks, when is the last time you saw a fat girl walk on the field in a Dolphins cheerleader uniform? These girls are there for the men. Which is totally cool. NFL cheerleading isn't a sport. Competition cheerleading is, but NFL girls don't compete. There have been several NFL cheerleader sets over the years, and I'd like to think I have them all - other than team issues of course. The oldest set in my Women In Sports collection is the 1981 Dallas Cowboy Cheerleaders set, printed in large format (4"x8" I think). Ten years later, Lime Rock issued two sets - one for NBA cheerleaders and another for the NFL. The Cowboys and 49ers issued sets in the early '90s, and another large NFL set was issued in 1994. But then, things got quiet. 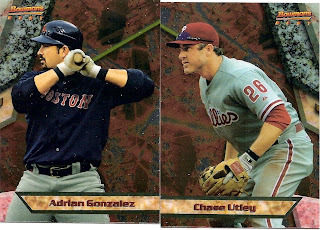 The next (and last) set to be issued to my knowledge is seen here, an insert set in 2009 Topps Chrome. Of the five cards shown, Kelli is definitely my favorite. A quick check of the Jaguars Cheerleaders website (thanks, Google!) shows that she is still with the team - her fifth year - and she's only 22. She's been there since she finished high school? Wow. Cheerleader sets are tough to locate. Other than this insert set, the releases aren't listed through Beckett, and only some of them are listed in the non-sport equivalent (Non-Sport Update). Does anybody know if cheerleaders do fan packs, like MLB teams do? By the way, those of you waiting on the National Chicle list - it's coming. I've been sick since Sunday evening so I've avoided anything requiring deep thought. Cheerleaders require no thought at all! It's time for another contest! 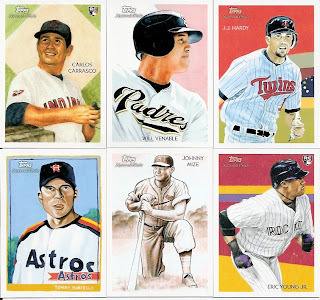 Head on over to The Card Hobbyist to get started and read up on how to participate. 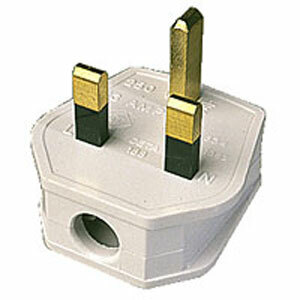 Now, other types of plugs. 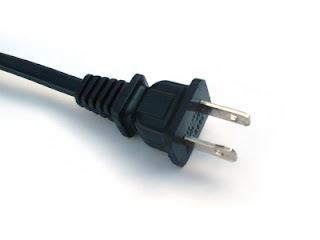 There's another kind of plug, but I won't be posting it here. Just to not be NSFW. 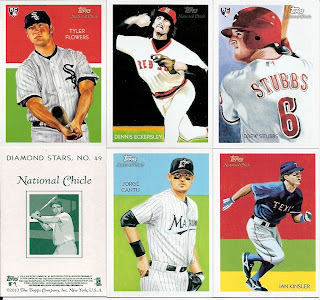 2012 Topps Heritage: Is there anything really exciting about it? First, real quick: when is the last time you've heard of a manager being traded? Ozzie Guillen was traded to the Marlins for a couple minor league players yesterday. This isn't a hate on Heritage. I'm this close to collecting the annual throwback set. What's stopping me? The set is just this close to being right. I have no beef with Heritage. I'm not going into that, though. Topps released "early sneak peek" preview images on Twitter today for next year's issue. The 1963 design is one of my favorites, but I have to wonder: is it really necessary to post preview images of a design we already expect to see? 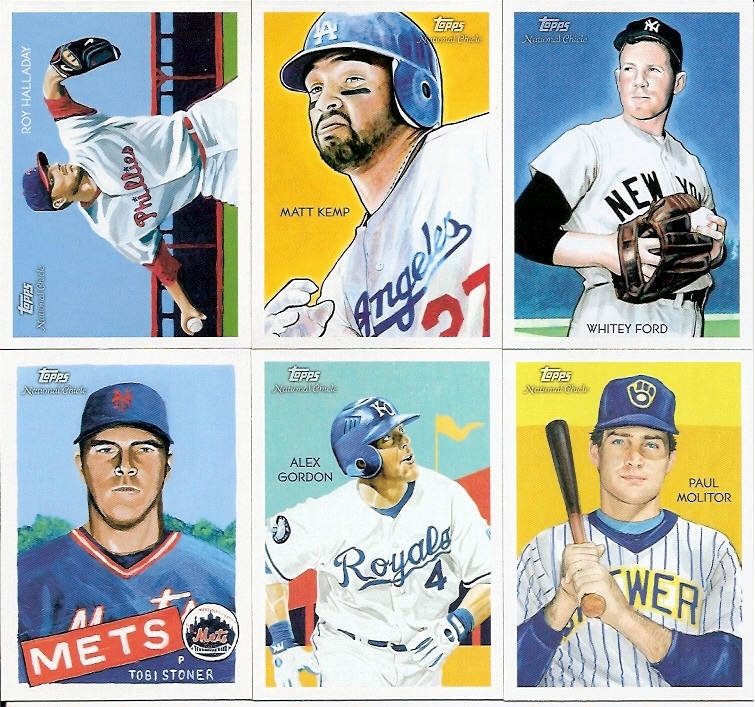 Did anyone really think Topps might decide to skip a year or two? Or perhaps throw out one of its best sellers? 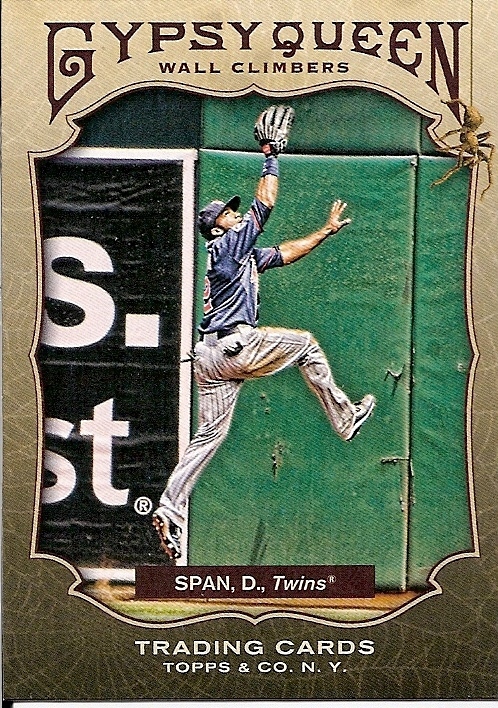 Were they afraid people might think Topps would go all gold-crazy and foil up the card? I'm just wondering. I ain't hatin'. 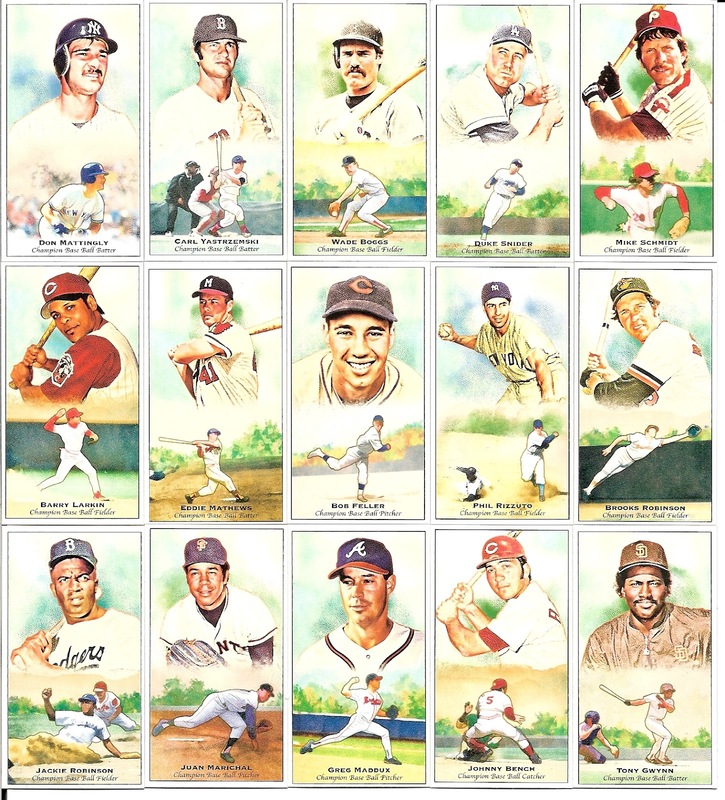 What I really want to see is the follow-up to the '62 Mint cards from this year's set (which, by the way, I still can't get my hands on). I wouldn't mind seeing a couple of the inserts get replaced or revised (Throwbacks and News Throwbacks need sprucing up, especially). I am guessing the throwback insert will be Peel-Offs, which were stickers that looked somewhat similar to the rub-offs of later years. I suppose we'll see in a week or so when they drop the sell sheet. It's good to see Ryan Braun getting recognition. He would be my choice for NL MVP this year - Matt Kemp has mostly better numbers but Braun's contributing to a contending team. 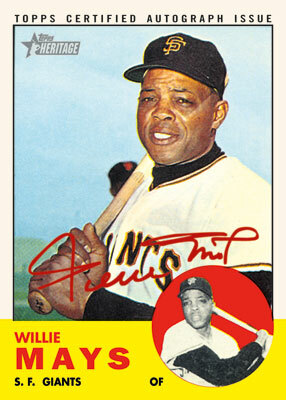 Seeing a Willie Mays autograph is no shock to me, given the announcement of his deal with Topps. Is anyone really surprised by these previews? Is it really that thrilling and exciting to know that, hey, the design is going to look just like it's supposed to? 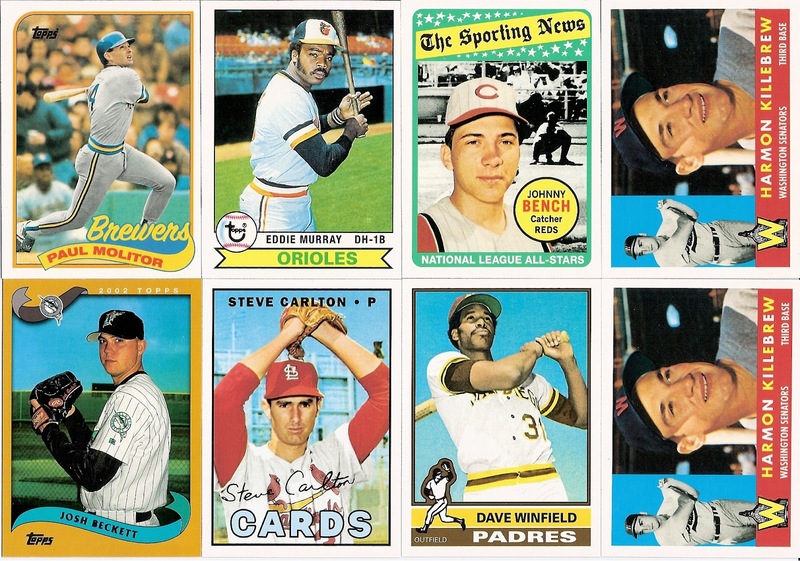 Despite owning the baseball card market in the 1960s and 1970s, Topps liked to experiment. This is evidenced by the crazy collection of inserts and test sets issued over those two decades - cloth stickers, embossed cards, decals, deckle-edged cards, posters, booklets, coins, giants, stand-ups... the selection is certainly there, and much more unique than the standard inserts found in today's packs. The one aspect of Topps that kids could count on was the issuing of multiple series through the year. It makes sense - kids would buy more packs throughout the year if there was something new waiting for them every month or so. As a kid with a quarter walking into the corner store in July, would you choose the 4-month old cards you've already seen over the brand new comic books or a candy bar? Of course not! But hey, what's that? The third series is out? Cool! Well, 1974 was different. 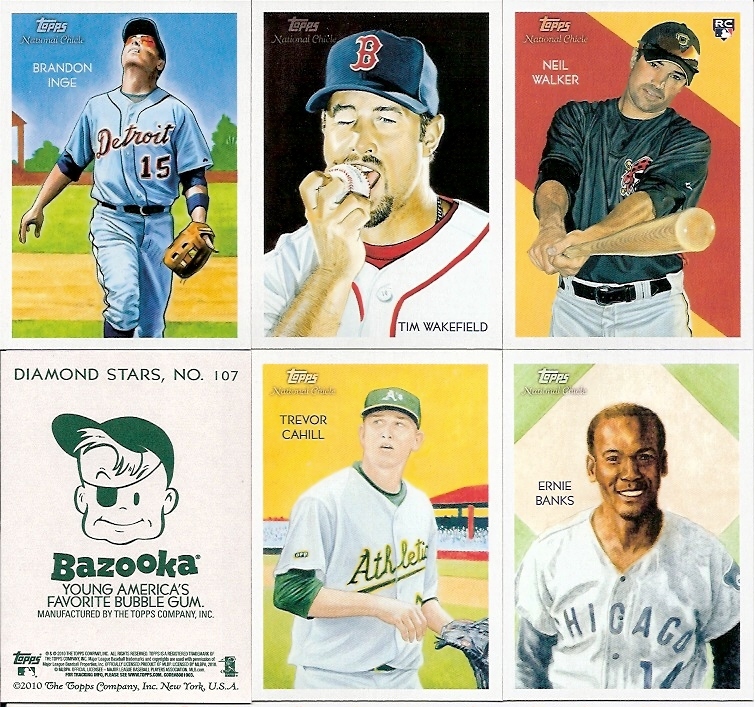 Rather than spread the 660-card set out over the year, Topps decided to go with a single series. That was probably a pretty bad choice in a year that had the possibility of a team moving across the country, which resulted in Topps printing cards for players on a team that never existed. But that's another story. 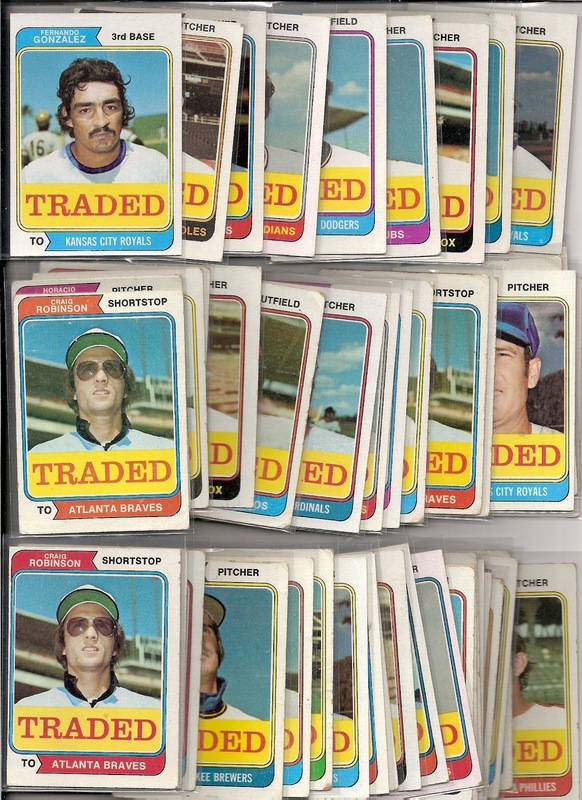 Several trades went through in December, and later in the 1974 season Topps inserted the first "Traded" set into regular 1974 packs. 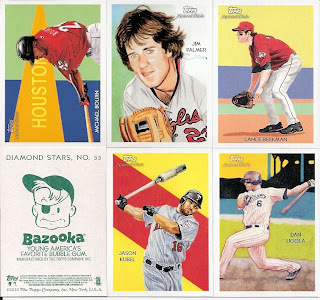 The set was released similar to 1989 Upper Deck's "Final Edition" in which the cards were mixed in with the rest of the set. 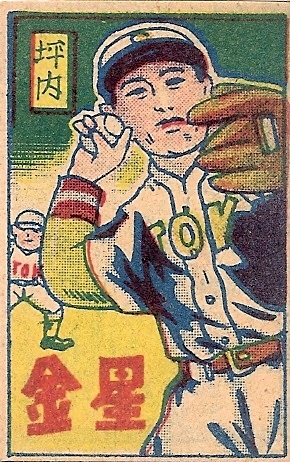 The cards are numbered the same as their regular cards in the set, except for a T suffix, while the backs have a newspaper design to explain the trade. This set is famous (or is it infamous) for its photography. You can tell from what's visible of the cards in the scan above, that the cards feature head shots and heavy airbrushing. 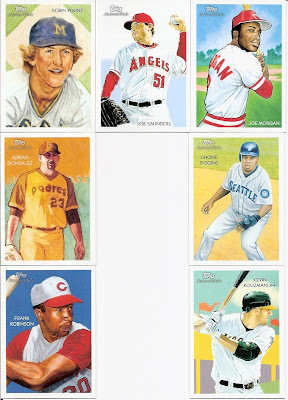 The set is complete at 44 cards, with Juan Marichal, Ron Santo, and Lou Pinella being the key cards. What does the Japanese language and this menko card have to do with my contest? If you read the drivel I post here instead of just looking at the pretty pictures, you might remember that this weekend was a busy one for me. Saturday was an all-day seminar/interview for a job to teach English in Japan. I don't want to count my chickens before they're hatched, but if things work out like I hope (and expect) them to, I'll be posting from the greater Tokyo area in six months. Or somewhere in Japan. After the interview, I was able to spend some time browsing the Serramonte card show, and came home with quite a few goodies. I returned Sunday morning to hunt for some trade bait, mainly for people I owe. I think I've finally assembled a decent package for Dominic, I have a relic for Jim when I meet up with him to see Moneyball, and I picked up a Biggio dual relic for Sam (The Dimwit). Plus, I have a Russell Martin autograph that I hope Greg Z might want, or if not, maybe somebody else can jump in. I might have found a couple things for Jeff L and Napkin Doon, but I'm not too happy with my offering yet. I may have to hit the 'Bay for them. After the show, I hit up a festival-type thing and wore myself out (note to self: start carrying water or something, because you keep dehydrating yourself when you go places). I was going to check out an art exhibition but had to pass. Look at me telling you all this like you care! But, I can say that this weekend was very successful, in the future career front, keep-myself-entertained front, and trading card front. I now have so much card-related material to write about that I shouldn't need to buy any cards for a month. Not that that will stop me! I'll write those later today, though. In the meantime, I have a contest winner to announce. 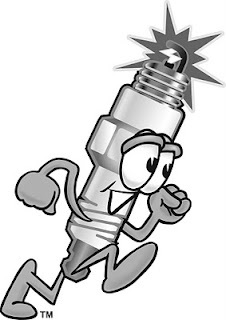 While some of you use feed aggregators (including Google Reader and apps on your iPod, iPad or smart phones), there are many who use their own blog rolls or others (such as the Sports Card Blogroll or Night Owl) on a regular basis. A few of you use the Blogger Dashboard for reading. I use Google Reader most of the time. I have to click through to the actual sites to leave comments, and of course if I want to find want lists or older posts I just go right to the site (Google Reader's search isn't the greatest). Nearly everyone checks at least once a day. Most of you check at least twice, with some devoted blogoholics checking multiple times throughout the day. I was surprised at how many check in the morning before work. 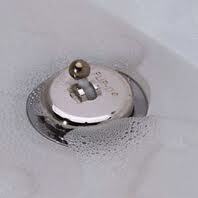 I have to admit I am one of the folks who checks throughout the day, mainly because I have plenty of free time. I know when I return to the workforce that will change. Several of you follow or read over 100 blogs, with a few of you over 300. Some readers (mainly the blogroll users) followed the links that most interested them. A couple stated they read only a few blogs regularly, and select interesting articles to read from other blogs. I believe I mentioned I follow around 100 blogs, and thanks to Google Reader I'm able to at least skim every article. I noticed (partly inspired by the comments) that my blogroll didn't have all the blogs I was following. I fixed that - sorry to those who didn't show up for the past several months. I'll have to check it monthly. And knowing that there are over 380 blogs out there (dayf reads them all when not watching ponies) means that I've got to be missing some out there. But that's not why you're here. You're here to see if you won. In fact, I bet you didn't read any of the above, and instead simply scrolled to the image below. I don't blame you. There were 32 entries into the contest (33 comments, 2 by one person), all of which were crammed into random.org and scrambled like the eggs in a McDonald's breakfast sandwich. 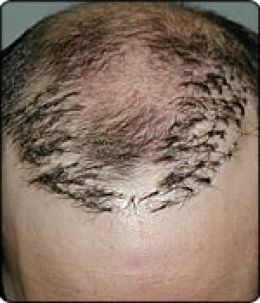 Hackenbush, you're the next contestant on the randomizer is right! Hackenbush is a mathematical game that is incredibly complicated to master but easy to play. At least, that's what I'm guessing. 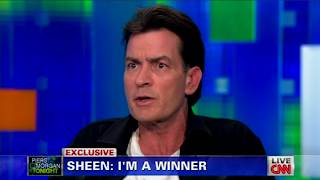 I suppose it could be like the Rubix cube, where once you know how to work the algorithms, it's not too tough to win. This Hackenbush runs Can't Have Too Many Cards, which has been running for over two years. His most recent post (Sunday night) was about the end of REM, a band I "discovered" in high school when Everybody Hurts got all that airplay. I wandered through their catalog and discovered much of their older hits, and I was lucky enough to be in the front row when they came to Atlanta a couple years ago. 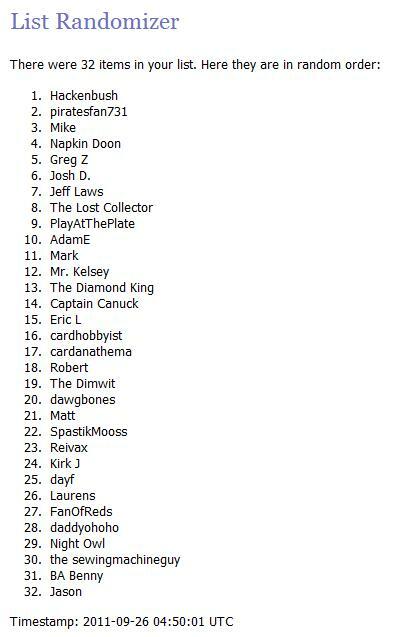 Hackenbush, please leave a comment or email me with your favorite team and players - I think I know but I want to confirm! I'll then begin the hunt for your prize winnings. Thank you to everyone for your input! Back to baseball cards in 12 hours! It's time to knock this bad boy out! Eight more packs to the end. This set is full of bright, vibrant color, like the Thurman Munson card. And there are cards which look like highly detailed fine-pencil drawings (Robin Yount). 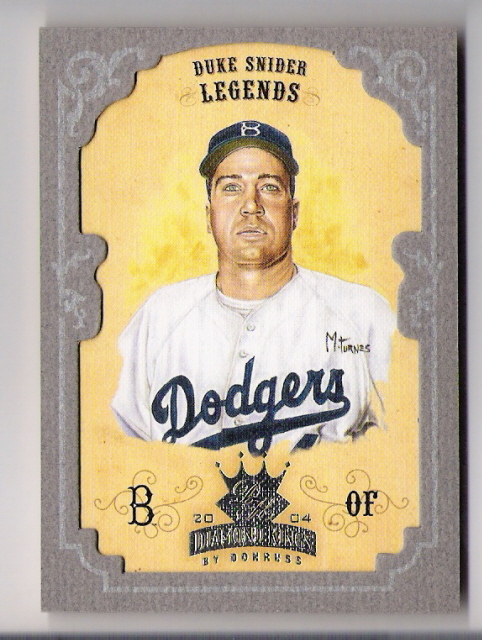 And then there are cards like Lou Gehrig, with death-black backgrounds. And sometimes there are short prints done in vintage Topps designs, like the Stoner card. Saundberg looks shocked and surprised, while Roy Campanella plays baseball on the edge of the river. Another Chicle back: Frank Robinson. Back when Topps 206 came out, with all the tobacco back variations, I thought the concept was pretty cool. And for the 206 set, it had meaning, since the original T206 cards had different backs. 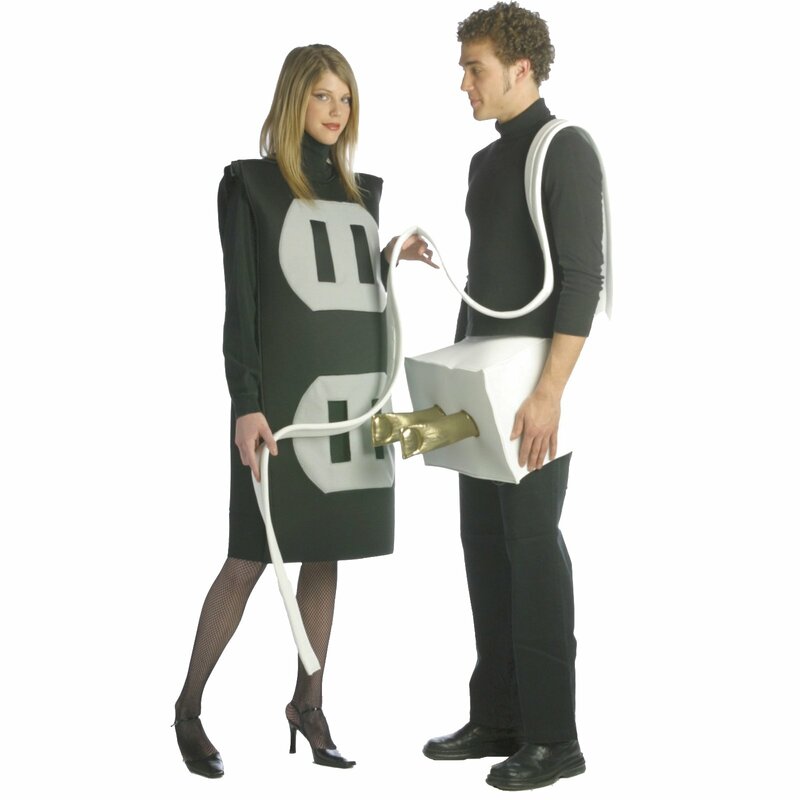 I don't like the concept here. If they had done the set in mini form (the same size as the original Diamond Stars of course, not tobacco mini size) with the various backs it would have been better. Anyway, this is our sixth Chicle back, the average for the box. Speaking of back parallels, here's our other Bazooka back. That would be Mr. Carl Crawford. By the way, what team did Michael Bourn play for in 2010? Oh, right. Houston. 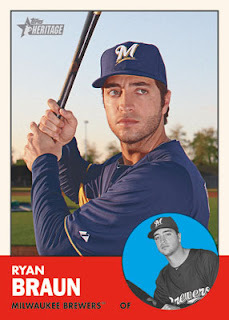 Thanks for reminding us, Topps. Three packs left, and this one contains another SP. The 1991 Topps version is one of my favorites. 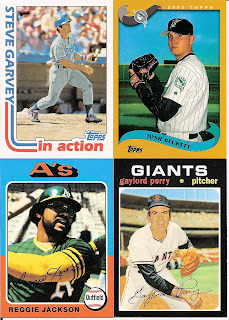 Why do I like junk wax era Topps so much? Hey, a bonus Chicle! Let's see if anyone wants it. I know there's a Kevin Kouzmanoff fan out there somewhere! No, really, I know. I just can't remember who it is. Bazoooooooooooooooooooka! It's numbered to 99! That's an awesome hit! Relics hit, on average, every two boxes, and this one has even tougher odds. That's a keeper, and a great end to the box. I'll have a recap/have list ASAP for you if you're trying to finish the set! Time for more fun! 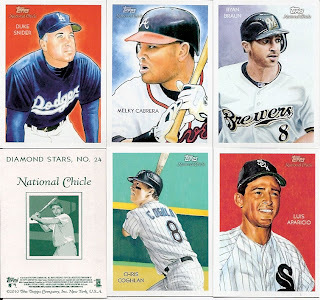 Continuing the break of the National Chicle box - this is the middle of the three sets. Purple backgrounds are awesome! Sort of. It works, I guess. I like Juan Pierre's face in this one. And Buster Posey is the key card in the base set - that would be his RC. 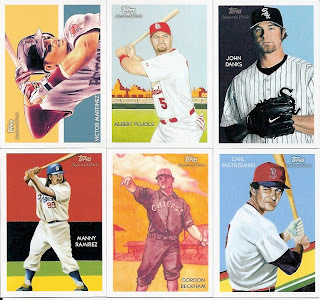 You would think Pujols is the best card in this pack, and you might be right, except for Mr. 99 sitting in the bottom left corner. You see, he's a short print. That makes Manny more specialer than Albert. I guess. I'd rather have more Pujols. *Yawn* just another pack in the box. Hey, what's that fading and blue squiggle at the bottom of that card there on the bottom left? Hey, that's an autograph! How pleasant! Checking the odds, I should expect one autograph per box, so here it is. It's time for another parallel, this time of Adrian Gonzalez. The Dennis Eckersley is a nice card too. And another parallel; this Bazooka is Teixeira. Is Tim Wakefield eating a baseball? Seriously? It's short print time again. The Ryne Sandberg and Walter Johnson are both retired SPs! And once again the last pack has a Chicle parallel. Chone Figgins. That Kurt Suzuki card is kind of a strange image. We'll finish this up in twelve hours! Hammerin' Hank Aaron's best Autograph? 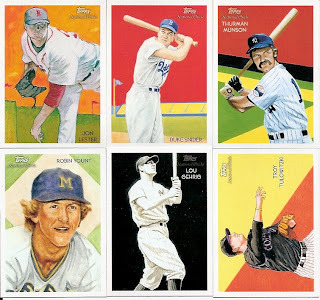 Panini Swings the Bat: What I'd like to see! 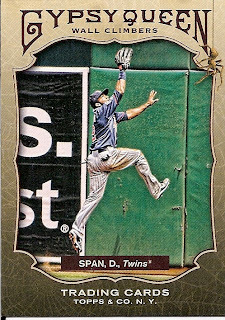 Racking up 2011 Topps Chrome. 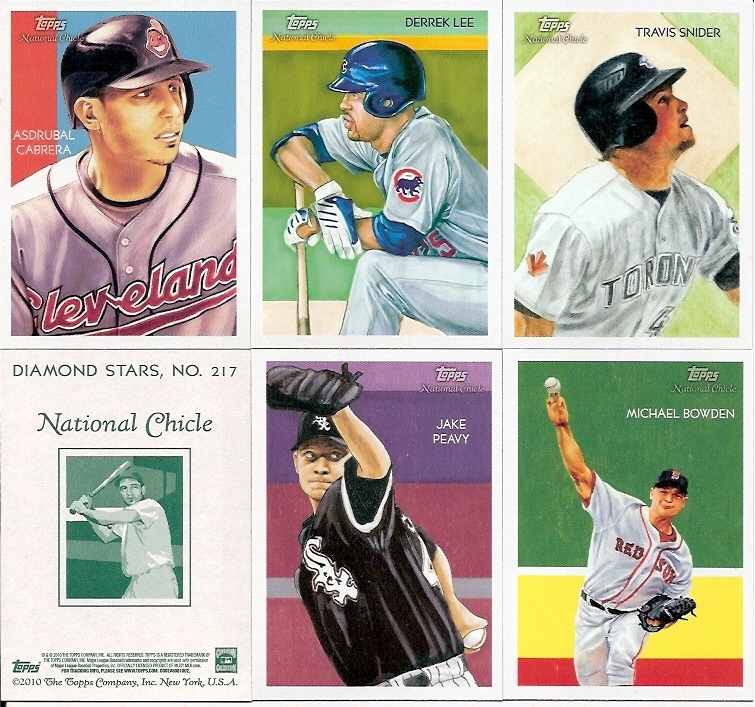 2011 Topps Stickers for Trade: The List! 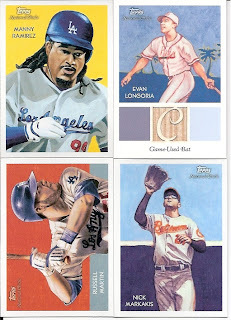 2011 Topps Stickers 8! U.G.G.L.A. 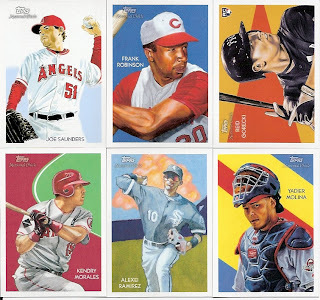 2011 Topps Stickers 7! Nyan! 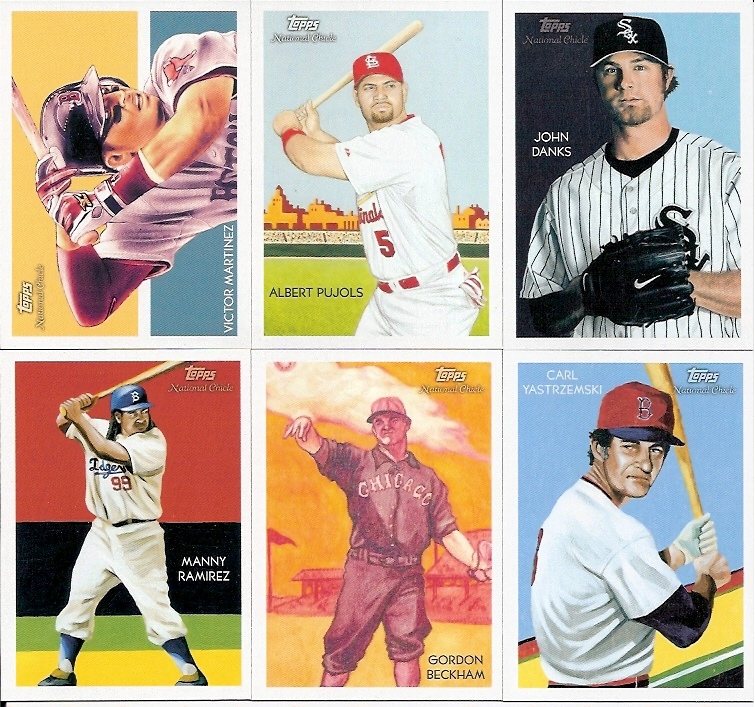 2011 Topps Stickers 6! What now? 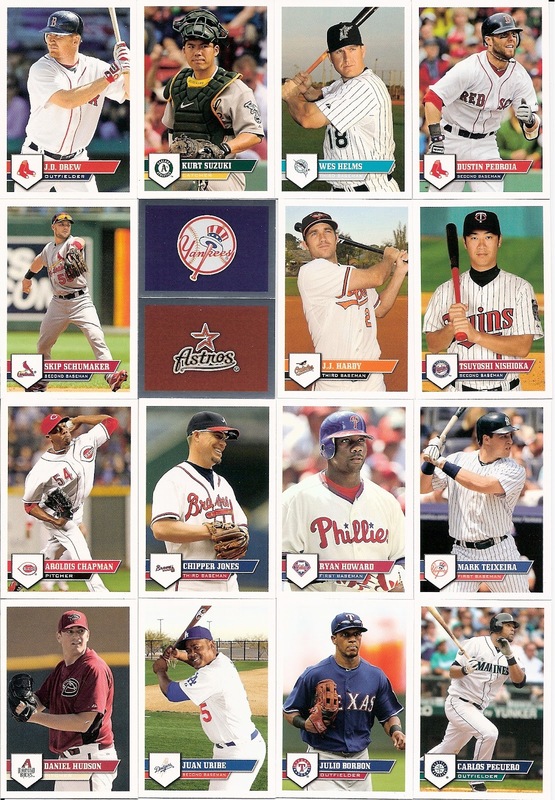 2011 Topps Stickers 5! Bam! Stiiii...ckers! 2011 Topps Stickers 4! A Double Big Mac, and maybe some fries? Whatever Happened to Frisbee Football? Young Superstars? I think not! GT Show: Gaudy is Great! A little something to look out for.